On September 18, 2018, Superintendent, Dr. Anthony Hamlet shared the 2018 State of the District report. 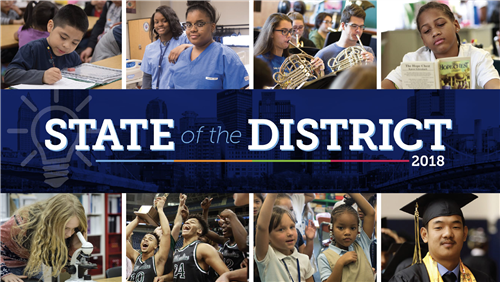 The report, presented to stakeholders at Pittsburgh CAPA 6-12, provided an update on the District’s success, challenges, goals, and future plans since the release of its 2017-2022 Strategic Plan: Expect Great Things. While state exams only provide a snapshot student performance, the report included student achievement results from the 2018 Pennsylvania System of School Assessment (PSSA) and Keystone Exams. In addition, other key performance indicators, such as graduation rates and suspension rates were presented. Dr. Hamlet also provided an update of the District’s progress in Phase 1 of the strategic plan and implementation of the 137 recommendations of the third-party analysis conducted by Council of the Great City Schools. Participants in State of the District included the Posting of the Colors by the Pittsburgh Perry Junior ROTC, the Star-Spangled Banner performed by Pittsburgh CAPA Vocal Major Selena Williams, and performances by the Pittsburgh Miller African Drummers, Pittsburgh Brashear Nepali Dance Team, and Pittsburgh Faison Choir. A reception before the event included a continental breakfast prepared by students in the District’s Career and Technical Education (CTE) Culinary Program and music by student harpist of Pittsburgh CAPA. View the event, which was streamed live on the District’s website, in its entirety. State of the District - September 18, 2018 from Pittsburgh Public Schools on Vimeo.